My favorite recipe for homemade chocolate chip oatmeal cookies. I load them up with shredded coconut and chopped pecans for extra added deliciousness. Trust me, these are going to become a family favorite! Buttery, chewy, chocolate chip oatmeal cookies are always my favorite.You know why? Because I don’t have to choose between a chocolate chip cookie and an oatmeal one. One bite and i’m falling hard over the large melted chcoolate chunks, lots of little oat flakes, the crunchy pecan nuts, and the sweet shredded coconut makes me want to binge eat cookies till next Tuesday. I made these cookies last Friday and the hubby said they were good enough to sell them in a gourmet bakery. I made a second batch on Saturday and I kid you not, these dark chocolate chip oatmeal cookies went flying out of the cookie jar. This oatmeal cookie recipe is quickly becoming my favorite. 1.) because dark chocolate chunks and 2.) the oat flake texture makes me feel like these cookies might be a little healthy? Reaching here but that’s okay. and 3.) a pinch of flaked sea salt when they’re right out of the oven makes the flavors well balanced and addicting. 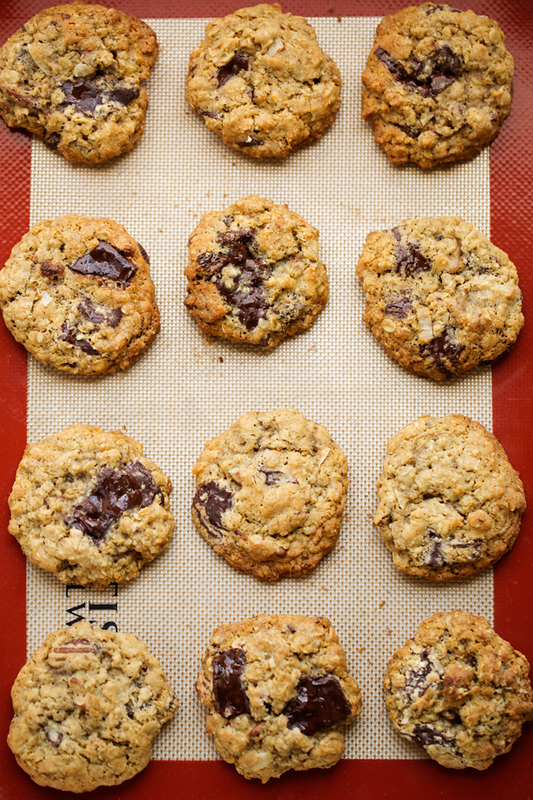 Today’s cookie recipe is all about the oats. I would say this is a good mash up between a sandies pecan cookie with a chocolate chunk cookie and a traditional oatmeal raisin cookie, minus the raisins of course. 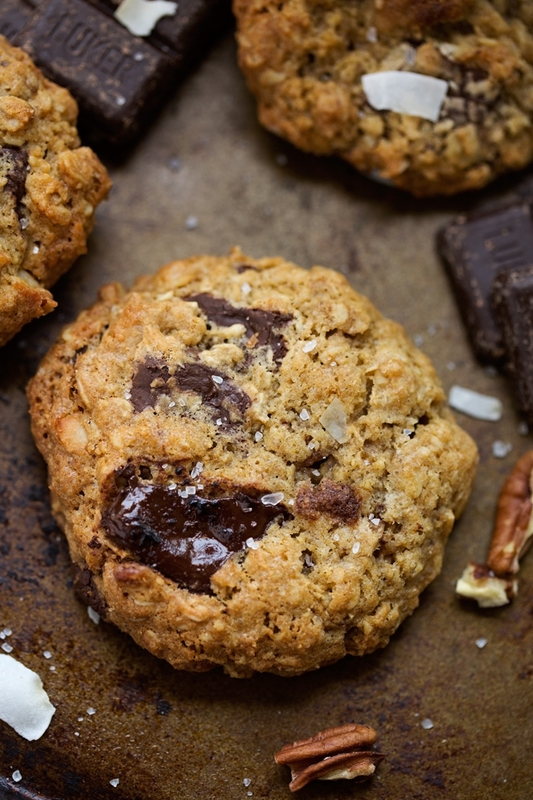 I packed as many oats as I could inside these cookies and loaded them up with brown sugar, butter, and tons of chocolate chunks for good measure. The brown sugar and butter together help the cookies from becoming dry in the oven. In fact, we kept ours in an airtight cookie jar and they tasted just as delicious on Monday as they did when I baked them on Saturday! 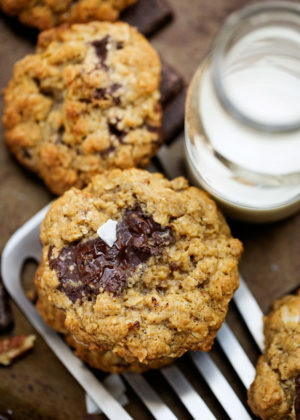 I’m a sucker for a good chewy chocolate chip cookies, and this oatmeal chocolate chunk cookie is the epitome of chewiness. The high brown sugar content along with the butter helps make these melt in your mouth delicious and insanely chewy. If you aren’t a big fan of dark chocolate chunks, you can swap them for white chocolate chips or even semi sweet chocolate chips! I added a bunch of chopped pecans too because we love the taste of nuts and chocolate together in a cookie. You can swap the pecans for walnuts or even almonds if you’d like. And the last thing, my recipe uses 1/2 cup of desiccated coconut. This is also sometimes known as macaroon coconut. It’s the finest shredded coconut that you can find before it becomes coconut flour. It’s unsweetened and adds tons of flavor to the cookies. The hubby is out of town on weekdays, so I lovingly filled a baggy and sent them with him for a little taste of home away from home. 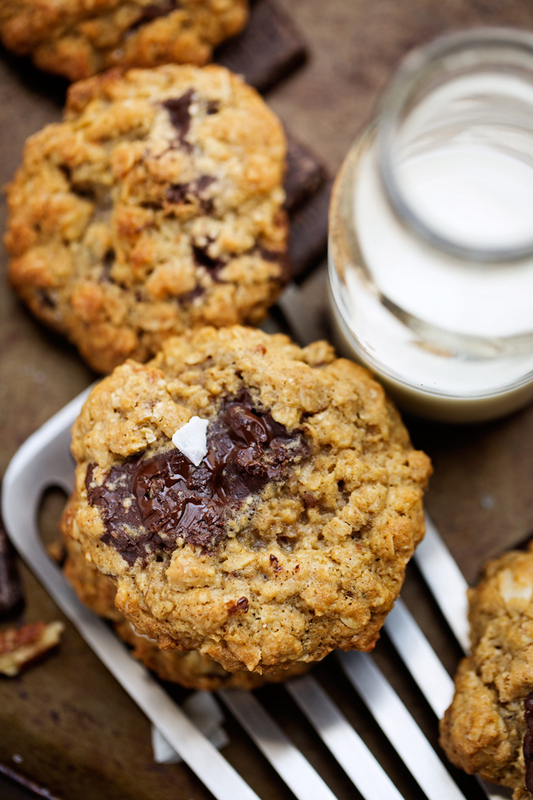 Fresh chocolate chip oatmeal cookies make the workweek bearable! In a medium bowl, whisk together the all-purpose flour, macaroon coconut, salt, and baking soda, set aside. In an electric mixer, fitted with the paddle attachment, cream the butter and sugars together for 2 minutes or until the butter mixture lightens in color on medium speed. Lower the speed and add the eggs one at a time until combined. Add the vanilla extract, let mix. Lower the speed to stir, add in the flour mixture in 2-3 batches only mixing until the flour is incorporated. Stop the mixer, scrape down the sides of the bowl and fold in the rolled oats, chocolate chunks, shaved coconut, and nuts. Cover and refrigerate the dough for 1 – 24 hours. Position racks near the center of the oven and preheat the oven to 325ºF. Line two baking sheets with parchment paper (or a silicone baking mat). Scoop the dough onto sheets. I used about 3 tablespoons of dough per cookie and 6 cookies per baking sheet. Bake for 11-14 minutes. The cookies will look very soft and underbaked. Sprinkle with sea salt flakes if desired. They will continue to bake on the cookie sheet. Let cool on baking sheet for 8-10 minutes before moving to cooling rack. Leftover cookies should be kept in an air-tight container and will remain fresh for up to 1 week. Baked cookies can also be frozen for up to 2 months. Cookie dough balls can also be frozen for around 3-4 months. Frozen dough balls will have roughly the same bake time. You don’t have to thaw them. BUTTER: If you don’t have salted butter, you can up the salt to 1/2 teaspoon. NUTS: you can also use walnuts or almonds in place of the pecans. MACAROON COCONUT: Is finely shredded coconut. It’s the finest shredded coconut form before coconut flour. Coconut flour should not be used as a replacement. *Please note: the nutritional facts calculated are an estimate based on the ingredients i’ve used. If you’d like a more accurate count, please calculate them using the ingredients/brands you’ve used to prepare the recipe. 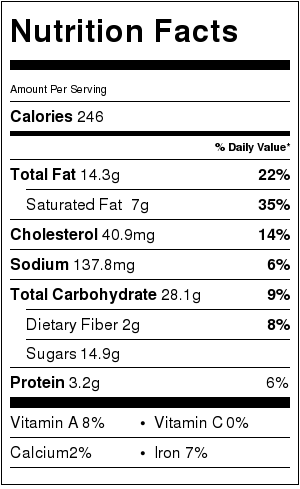 Nutritional facts are based on 18 servings of Loaded Dark Chocolate Chip Oatmeal Cookies.